BJ SK50P CNC eszterga - CNC gép, kábelvédő, fúrótömlő; Kutenich Kft. 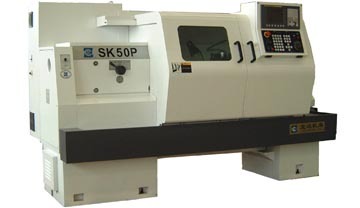 The SK50P is a CNC horizontal lathe. The spindle speed is changed mechanically in three gears together with control of a frequency changer. The lathe has 4 types (750, 1000, 1500 and 2000). These numbers denote the maximal work piece length; thus the machines can use 750 mm, 1 000 mm, 1 500 mm or 2 000 mm workpieces. The machine comes with a 4-station (standard) or 6-station (optional) turret. These lathes can perform internal and external cylinderical turning, arbitrary taper turning, facing and threading. They are suitable for various middle or small batch production, especially for complicated and high accuracy workpieces. Control systems such as FANUC 0i-TC, FANUC 0i Mate-TC, Dasen 3i, Sinumerik 802D are provided on request. The numbers denote the maximal work piece length. The machines can use 750 mm, 1 000 mm, 1 500 mm or 2 000 mm workpieces, respectively.